This set is so sweet and simple! I love the timelessness of it and how it shows Ashdon as he is now. Before you know it, this little man will be crawling and walking faster than we can keep up! The simplest images are always a classic for these sessions but it’s always fun to mix it up, especially with sets that have meaning. This little guy’s nickname is Camp, so how fun is this little set that matches his nickname? When it has meaning, it will always outlast the random sets. This backdrop is from Intuition Backgrounds (love their backdrops!). Ashdon’s personality is so calm and sweet, just as it was when he was a newborn! Another thing I love about these sessions is capturing the milestones that the little guy has achieved. He’s sitting up, rolling over, and loves those toes. It’s really all about those details that will change so quickly! Thank you for stopping by the blog! If you have a chance, drop by the Facebook page for the latest sessions and work. Also check out the baby portfolio page to see similar work. 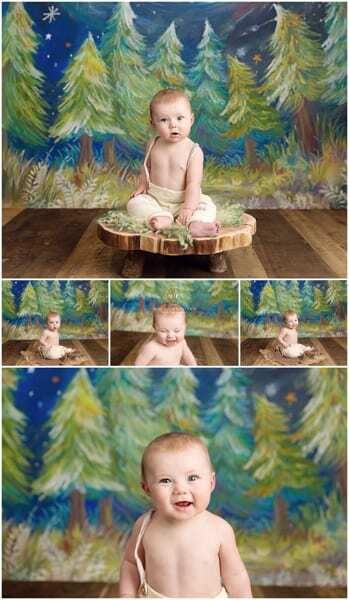 We love babies of all ages and capturing their milestones! Looking for Cleveland Baby Photography? To inquire about scheduling your session or for more information, please contact Mary at mary@marychristinephotography.com or call 330-241-0424.